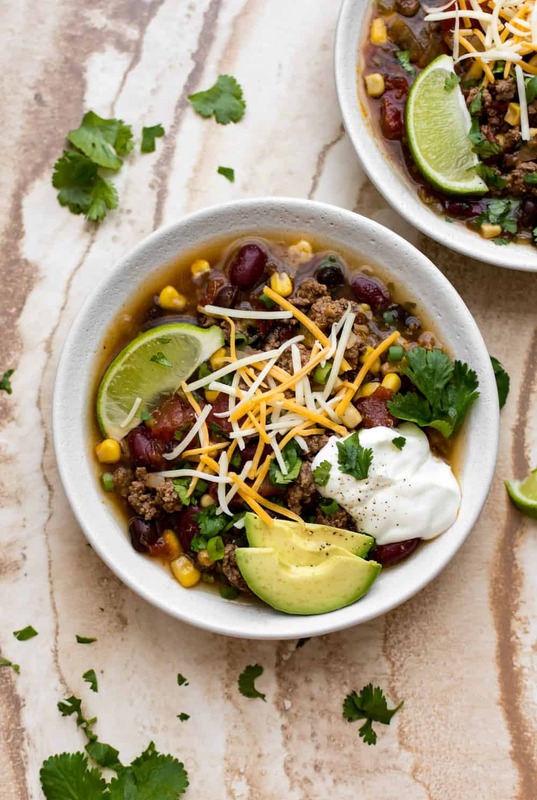 Crockpot Taco Soup is flavorful, comforting, and easy to make. Everyone will love selecting their own toppings to customize this delicious soup! 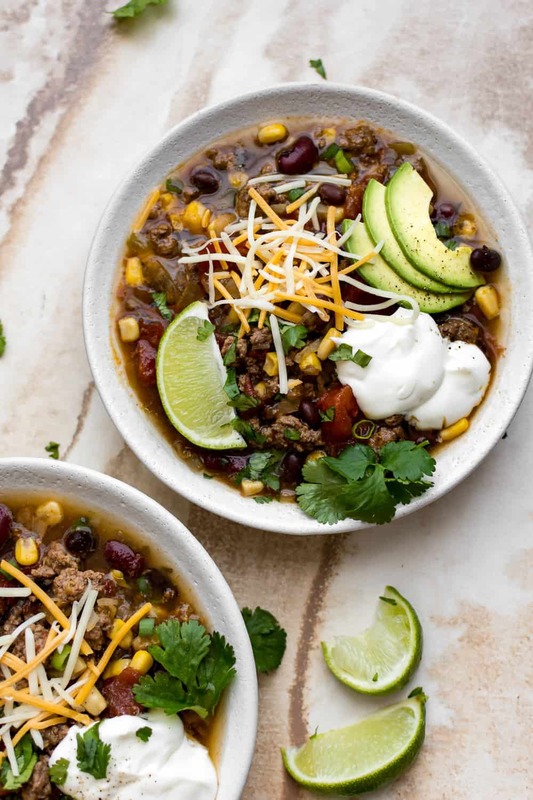 If you’re looking for more hearty soups, try this Easy Cheesy Taco Soup, Beef and Cabbage Soup, Slow Cooker Enchilada Soup, or this 20 Minute Black Bean Soup. Hi! It’s Natasha here from Salt & Lavender. My Crockpot is such a lifesaver for busy weeknights. I’ll either make a big batch of something on Sunday so I have meals ready for the week, or I’ll put it on in the morning before the day gets hectic. Either way is a win! 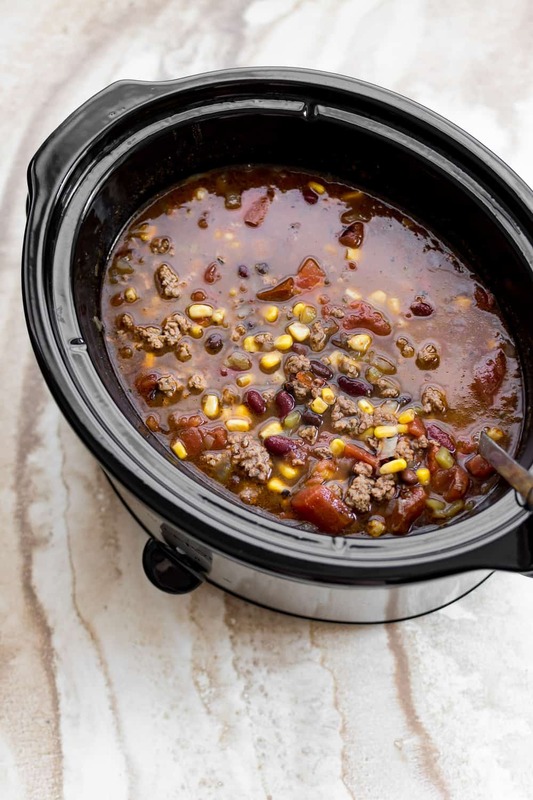 This slow cooker taco soup recipe is easy to prepare, and the whole family will love it. And, of course, the toppings are the best part. What are you waiting for? Brown the beef and discard most of the fat from the pan (I like to leave a bit in to give the soup extra flavor). Add all the soup ingredients to your slow cooker. Give it a good stir and put the lid on. Cook for 6-8 hours on low or 3-4 hours on high. Prep your toppings and then top the soup as desired. Enjoy! How long do you cook Crockpot taco soup? 6-8 hours on low (I usually cook mine for 8 hours) or 3-4 hours on high. The longer you cook it, the more flavor it will have. You can top this soup with any combination of the suggestions below! 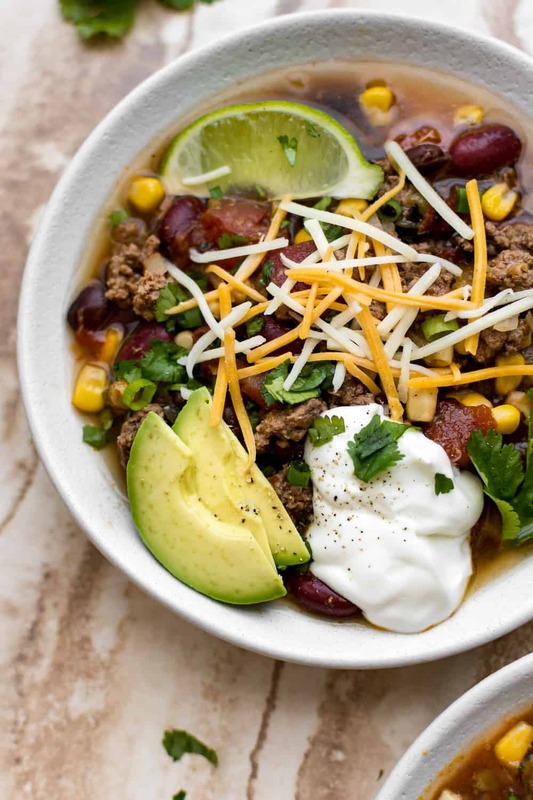 Crockpot Taco Soup is cozy, comforting, and easy to make. Everyone will love selecting their own toppings to customize this delicious soup! Optional toppings: sour cream, tortilla strips, scallions, avocado, shredded cheese, etc. Brown the beef in a skillet over medium-high heat, breaking the beef up with your spoon as you go along. Once the meat has browned, drain most of the fat (I like to leave a bit in for flavor), and add it to your slow cooker. Add the remaining ingredients to your Crockpot and give it a good stir. Close the lid and cook on low for 6-8 hours or high for 3-4 hours. Prior to serving, prepare your desired toppings. Give the soup a taste and season with salt & pepper if needed. Top the soup to taste and enjoy! Anything from 1-2 pounds of ground beef will work. If you're sensitive to salt, use low-sodium beef broth. You can use regular diced tomatoes, but fire-roasted ones have more flavor. If you don't want the soup to be spicy, leave out the cayenne pepper. Sound Delicious ! thanks for sharing , keep up the good work.